It's my final year of university, and this year one of my goals (apart from studying and all that) is to really get out and enjoy Leeds. It's such a cool, vibrant city and I want to make the most of it- I don't have long left as a student and I also don't know if I'll be here after I graduate (probably not, sadly). So here is a list of places, some I've been to before and some I haven't, that I want to go to this year in Leeds. Cliché as it is, I loooove autumn, so without even realising it most of the things I've bought recently have tended to be cozy and perfect for autumn, like tea and candles. Fellow autumn lovers, read on! Empties #7// Lush, Crazy Color, Lee Stafford, Etude House etc. I'm still trying to use up and slim down my beauty products, and this is the latest batch of empties. A lot of the products this month were things I really love and old faithfuls that I buy time after time, and there were a couple of little treats as well. Anyone who knows me IRL knows that I'm a pretty serial outfit repeater... I tend to buy a new piece and then get absolutely obsessed and wear it again as soon as I've washed it. This shirt is definitely one of those pieces. I picked it up from depop a few months ago (I blogged about it in my new in fashion haul) and it's been on heavy rotation ever since. It's thin enough for summer, but the colour means it's also perfect for autumn/winter too! I hadn't planned to take outfit photos that day, but when I saw this wall, I had a classic blogger "this wall is cool stop everything and take my picture!!?" moment and made my sister take a few snaps. Exciting news today! As you'll have gathered from the title of this post, I made my first youtube video! 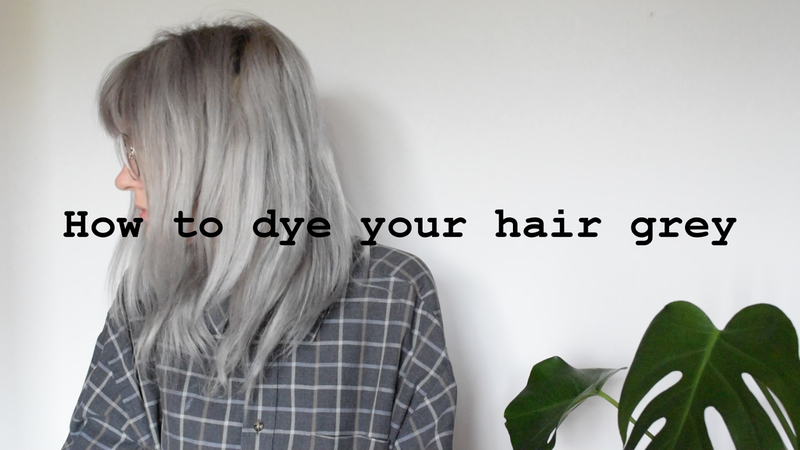 I decided to film myself dying my hair grey because my review of Makki's hair colouring mask in grey is one of my most read posts by far. I figured that if I was going to make a Youtube video, I might as well make it useful! So here is my baby! I hope you enjoy it! Thanks for reading/ watching!! If you have anything you want me to film, let me know and I might do it? ?